Enjoy your karaoke experience at 1Kara with high-quality sound headphones. You’ll hear your voice and the music in perfectly clear sound. Lose yourself in your passion for singing! At 1Kara we provide high-quality condensor mics. Adjust the angle and height to suit you. Feel free to dance as you sing without holding a microphone! Don’t just sing like a professional, get the feeling of actually being in a recording studio! Use the mixer to change the background music or mood of your voice. You can arrange your voice to be bass, soprano or even add an echo! Maybe you’re worried using a mixer is too difficult – don’t worry! There are detailed explanations in PIT so you can use it easily. We will also be publishing more information on how to use it on our website in the future. Please visit our site again to check it out! We have created our karaoke facilities like those you might find in a future spaceship and called them PITs. We have fitted each PIT with all the features you need to enjoy your singing. There is nothing to hold you back now! PIT is a private space just for you so you can truly lose yourself to the music. 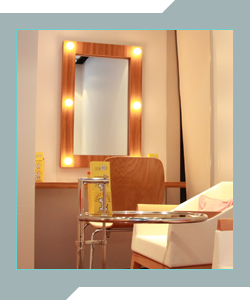 We have established a special Ladies’ ZONE so that the fairer gender can relax and enjoy 1Kara, too. We hope you agree that our spaces to freshen up and PIT autolocking features are unique and help you relax. *Unfortunately, these are currently only provided in some branches of 1Kara. 1Kara is a members-only ship. Newcomers will need to become members. *When registering to become a member, you will need your drivers license, health insurance card, or student ID. Once boarding procedures are complete, you need to decide your time and then head to your PIT. All 1Kara branches are fitted out like a spaceship so even getting to your room is a cosmic adventure. 3. It’s time for 1Kara! 1Kara is an entirely personal and private karaoke experience. With our high-quality headphones and condensor mic you can enjoy karaoke free from distractions. All of our PITs are sound-proofed so you can feel like a pro! We have a range of packages, but the drink bar is included in all packages. You can take these drinks into your PIT with you. After all, karaoke is thirsty business! Our staff won’t contact you on the interphone when your time is coming to an end. Instead we will display a notification ten minutes before your time is up. All that’s left is to return to reception, settle your bill, and disembark our ship. Thank you for singing with 1Kara.